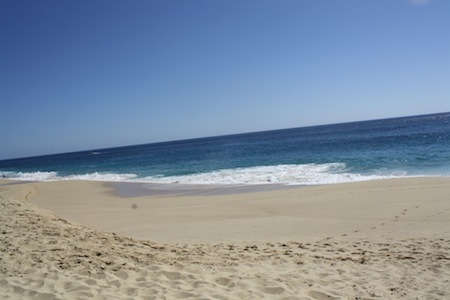 My husband’s favorite thing to do in Cabo is walk the beach. During our recent stay at the Pueblo Bonito Pacifica we walked their secluded beach and searched the wild habitat. He immediately transformed into an Indian Scout scouring the beach looking for trails and traces of marine life. This strange land where the desert meets the mountains is home to many interesting things to see and experience. I watched my husband as he delighted in spying hidden creatures that seem to appear when you least expect them. We walked the secluded Cabo beach at Pueblo Bonito, binoculars in hand, hoping to see flying manta rays. These beautiful creatures can be spotted leaping as high as 10ft out of the waters off the Cabo shores. They breach the surface of the water and launch into the air. Once airborne, the rays flap their fins to look like they are gliding through the air. San Jose del Cabo is home to migrating whales. Between the months of November to March, you can spy these incredible mammals off the shores of the Baja peninsula. You can view Blue, Gray, Humpback, and Sperm whales swimming in the beautiful Cabo Mexico waters. My husband pointed out schools of fish visible to the naked eye swimming in the waves of the crystal clear pacific waters. He shouted with glee, “Did you see them; they’re right at the top of the curl? !” He told me again that Cabo is referred to as the aquarium of the world because of its vast amount of schools of fish. The crabs wash in with the surf and burrow into the sand. You can spot them running across the Cabo beach before disappearing under your watching eyes. I dug in the sand with my bare foot, hoping to catch another look at this vanishing beach dweller. I saw the many tiny holes in the sand and smile as the crabs escape through their tiny escape hatches. My husband likes to stare out into the water, hoping to see a Marlin – one of the most beautiful large fish in existence. It can be argued that this is the most sought after game fish in the world. Whether you are in a boat, or on a Cabo beach, it is a special experience to see this amazing creature. Sea turtle sightings and expeditions on Cabo beaches are not uncommon. Many Cabo tour companies have sea turtle tours and there are several local charities dedicated to helping the small creatures. The sea turtle release in the video is from Baja and Beyond. What are some of the Cabo creatures you have seen on your beach walks?